As we move into the second half of 2017 and reflect on the first two quarters of the year, we continue to see a synchronized global recovery as well as sustainable expansion. During Q2, most asset classes, including equities and fixed income, posted higher returns with the exception being commodities. 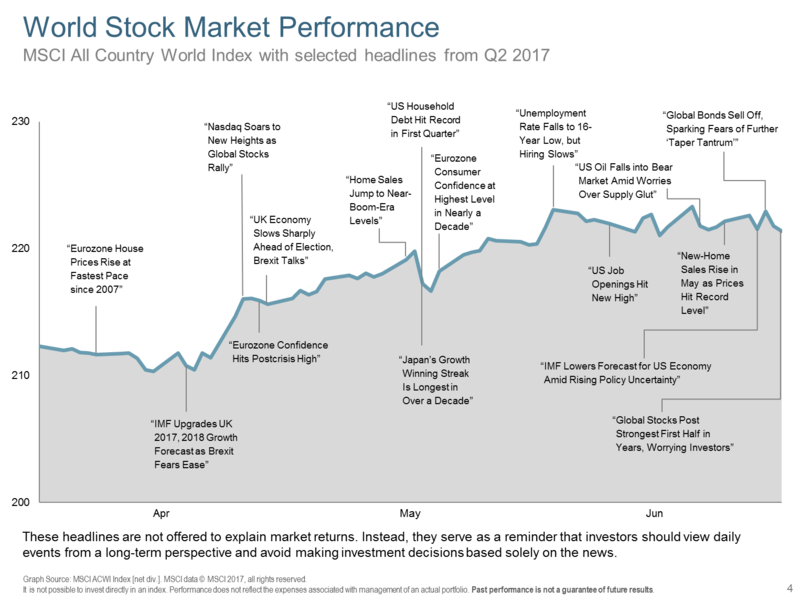 Despite a wide array of world wide political uncertainty, world stock markets have been unusually resilient, showing positive returns. International equity markets were particularly strong during the quarter after pro-Europe Emmanuel Macron claimed victory in France, allaying fears about anti-European Union (EU) sentiment. Market fluctuation was projected due to election outcomes in England, however, markets chose to focus on the increasing earnings story and central bank activity. In the U.S. earnings growth for the S&P 500 in the first quarter increased 14%, the best growth since 2011. First quarter earnings in Asia-Pacific, excluding Japan, and in Europe, also grew at a double-digit rate. Q2 earnings are beginning to be announced, with a majority of companies reporting higher than expected results. The S&P 500 closed the second quarter at about 18 times future projected earnings, its highest level in 13 years. Still, the forward looking multiple was not nearly as rich as the 26 times reached at the dot-com bubble peak in 2000 according to FactSet. Many experts feel the market is adequately to optimistically priced, but not “exuberantly” so. Although some analysts point to this economic recovery in its 10th year, as ready to die of old age, there are also a growing number that feel global markets have room to run. Their reasoning points to the breadth of past expansionary cycles (not years), as well as current conditions of higher employment and relatively low interest rates. From a valuation standpoint, within the continued global expansion, a consensus is forming for international and emerging markets to have an advantage relative to the U.S. The Federal Reserve raised interest rates again in early June as expected, while both the Bank of England and European Central Bank announced they no longer leaned toward easing. With inflation numbers in check (ex-energy) and unemployment levels at pre-crisis numbers (4.5%), it appears deflation concerns that have lingered over the past 10 years, dissipated. World bankers are now guiding market participants on plans to unwind the colossal amount of liquidity injected over the last 10 years. Thus far, short-term interest rates have increased four times in the U.S. since the end of 2015, while the ECB, BOE and Bank of Japan have mostly remained accommodative. Currently, there is indication all world banks may be tightening in the future. The Federal Reserve is setting expectations of another rate hike this year and released early details of its roadmap to unwind debt purchased during the crisis. For many years market participants feared runaway inflation as an effect of the Fed’s cumulative actions, and expected disruption to markets as liquidity was removed. To date the perceived risk of this happening is low given the yields for the U.S. 10-year Treasury note, which moved higher in March to 2.62%, reversed to end the quarter at 2.30%, and roughly stands there today. Although a central bank policy mistake, U.S. tax cuts, or a trade war could change that outlook, that is not the current view. Historically low government bond yields may be here to stay, given structural factors such as aging populations, poor productivity growth and high debt levels. 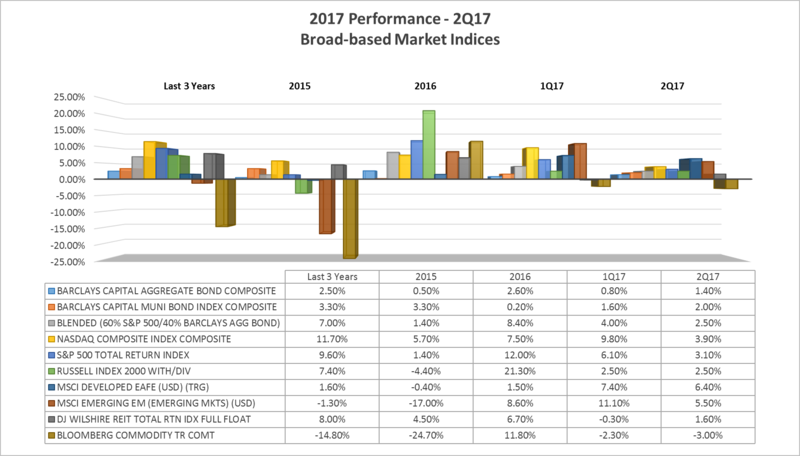 Once again, bonds have positively contributed to portfolio gains for the quarter and year. The price of oil, which influences alternative income and commodity investments declined significantly in Q2 as supply levels increased dramatically versus demand. Even an extension of OPEC members quotas into 2018 did little to lift prices. Despite the continued transition of the energy sector, we continue to believe in the longer-term story of owning real assets, income from dividends provided, and belief of its important role in a diversified portfolio. Commodities, which include: precious and industrial metals, agriculture, water, timber and coal are also to be included even though they have detracted year-to-date from returns. Should you have any questions about the above summary, or prefer to discuss more of the in-depth details, please feel free to contact us.